This page is dedicated to the conference champion teams. We won our first Upstate Eight Conference Championship in 2000 and have won 13 straight team championships since 2006. In 2009, we finished 1,2,3,4,5,6,7! In the 2015-2016 school year, we moved to the Dupage Valley Conference and also finished 1,2,3,4,5,6,7. Waubonsie Valley High School was the host for the trimmed down DVC meet (WWS, WN, GN, and Lake Park left the conference). We were fortunate enough to win the meet by scoring 26 points, placing 2, 3, 6, 7, 8, 12, and 18. For the first time in many years, we did not have a guy win it individually, with Naperville Central's Tom Shilgalis taking medalist honors. Overall, we were happy with the outcome, especially when comparing our times to the Sectional run on this course the previous year. We returned to St. James Farm, but this time we competed on a Monday, and had a much tougher time coming out on top. Due to heavy rains and T-storms the previous Saturday, it was decided the DVC meet would be moved to Monday. That Monday had temperatures in the low 60's and calm winds. The course was soft, but it held up well with all the rain. Heading into the meet, we decided to not run Junior Michael Madiol due to a nagging muscle strain behind his knee. From the beginning, it was obvious WWS had developed their race strategy based on us. They ran very well, and only because of a strong finish from Chris Keeley and Alex Johnson, were we able to squeak out a 34-37 victory. Zach Kinne won the overall title, running away from the pack at about 1200m into the race. St. James Farm was the location of the 2016 DVC meet. The weather was perfect - sunny and about 60 degrees. The course was muddy in spots and the ground was soft from heavy rains earlier in the week. It was the first time in our history we ran on this course. Having had school that day, and coming off an emotional Twilight race, we were kind of flat going in. We still managed to take charge from the start, and went 1, 2, 3, 4, 6, 7, and 8. Only Junior Ralph Papa from Metea Valley broke up our pack. Senior Jake McEneaney started out hard, built a comfortable lead, and coasted in for the individual win. This was our very first DVC meet. The race was on a Friday afternoon at Lake Park's East Campus course. The last time we ran here was in 2007 for the UEC meet, a historic day for us as a program. Well, this day also proved to be historic. Our guys ran together and managed to place 1,2,3,4,5,6,7. Wow! That was the response from many in the crowd, because as our guys approached the 2 mile mark, they had a ten second lead on the field and they were all within an arm's length of one another. They separated a little from that point on, with senior Dominic Dina kicking home to win the race in 14:55. We also won the FS and JV races, with our JV team also placing 1-7. All in all, it was a great way to start our tenure in the DVC. Our Varsity took the line in 2014, hoping to secure a ninth straight Conference title. For the second straight race, junior Connor Horn (1st place, 15:02) and seniors Dan Weiss (3rd, 15:12) and Michael Widmann (4th, 15:13) did battle against a flinty pack of front runners before outlasting the field. Perhaps the race of the day belonged to Aidan Livingston (5th, 15:16), who pushed the second mile to solidify his claim to 4th man. 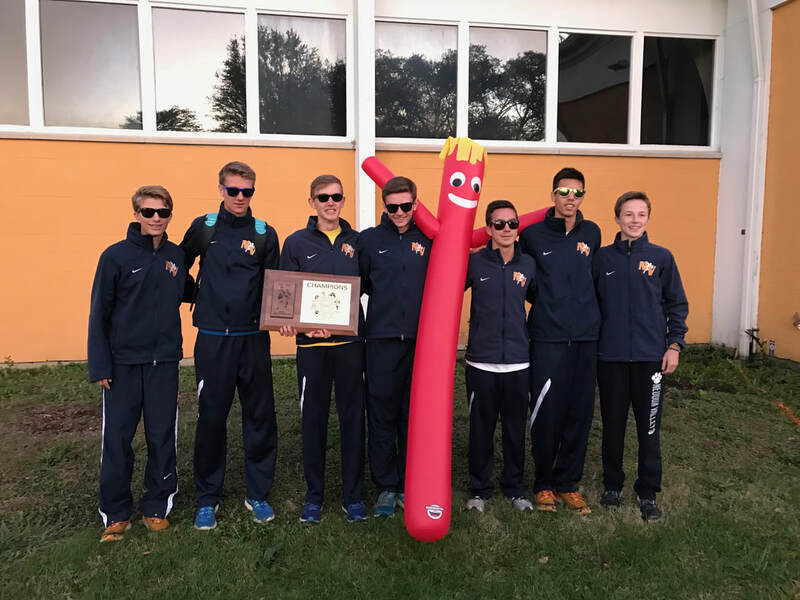 Juniors Dominic Dina (10th, 15:28), Austin Kinne (12th, 15:30), and Caleb Ferguson (13th, 15:37) all earned All-Conference honors, traversing bridges, vaulting creeks, and mounting a particularly nasty hill with grit and iron resolve. Matt Milostan easily won the f/s race. Matt Horsley and Jake Mceneaney went neck and neck to the finish in the JV race. Unfortunately, Jake hurt his hip during this race and was never the same the rest of the season. We started our streak here in 2006 with a 5th man tie-breaker. It was not that close this time, but it was a memorable end to our time in the Upstate 8. We returned to LeRoy Oakes in 2013 for another UEC Championship race. Unlike the year before, it was sunny, cold, and windy. Nick Bushelle ran with the leaders and eventually pulled away to defend his individual title from the year before. Our other guys packed up fairly well behind him and we were able to win our eighth straight title. Juniors Daniel Weiss (6th) and Michael Widmann (10th) were our other all-conference place winners. Freshman Jake Mceneaney finished 16th, just out of receiving all-conference honors. We took 6 of the top 7 spots in the JV race, with Colin Weidman outkicking Matt Livingston for the win. Overall, it was not our best conference performance, but we got the job done. The 2012 conference meet was one we will never forget. We returned to LeRoy Oakes, the site of our very first conference championship in 2000. With rain in the forecast later that a.m., the races were started close to one another to try and get them all in before the rains came. The varsity went first. Junior Nick Bushelle and Senior Alekh Meka ran with Spencer Gray of St. Charles North in the lead pack. It came down to a sprint at the end and we were able to go 1-2. Freshman Connor Horn made history by finishing 5th overall. He was followed closely by Brendan O’Connor in 8th. Mike Whaley continued his upward surge with an 11th place finish to finish out our top 5 scoring. We dominated the JV level, with 12 of the top 16 spots and we brought back the f/s trophy in the rain with only 24 points. The 2011 race was hosted by us at Dupage River Park. It was a nice day with temperatures in the low 50′s with 15mph winds. We came into the race as heavy favorites and we ran fairly well to bring home our 6th straight Conference title. This race marked Sophomore Nick Bushelle’s first varsity race since Peoria Woodruff so it was good to see him finish this race even though he did not run particularly well. Robblie Hohlman also ran varsity in this race (Steven Krauklis, who is pictured in the photo, won the JV race). Mark Derrick battled Matt Stewart from Metea Valley to win it individually with Taylor 10 seconds behind in 3rd. We dominated the JV level again but got a wake-up call at the fs level, finishing 3rd. 2010 marked the first year that our conference was divided into two divisions. Our division, called the Valley Division, ran this meet at Oakhurst Forest Preserve. It was a sunny day with temperatures in the high 50’s. Juniors Taylor Soltys and Mark Derrick battled WV’s David Greober throughout the race until they separated at about 2 miles. Taylor went on to win while Mark finished 3rd. Josh Ferguson and Josh Antonson also ran well, placing in the top 5. It was not a great race for us because our 5, 6 and 7 men did not run great, but taking four of the top five spots and five of the top nine was a solid effort on this day. The 2009 Conference meet was as historic as it gets. We achieved the unlikely, finishing 1,2,3,4,5,6,7! The stars must have been aligned this day because I have never heard of this happening in any major meet in Illinois. The meet was again held at Sunrise Park in Bartlett and it was a sunny day with temperatures in the mid 40’s. I told Aaron to run his usual race and he immediately went to the front and stayed in that position until the end. Our pack behind him was instructed to wait until the 1.5 mile mark and then make a gradual move to try and pass any runners in front of them. Kyle Zankowski, from St. Charles North, was about 30 meters in front of our pack and we started to close the gap. By the time we hit the 2.5 mile mark, four of our guys were well in front of him and now it was a question of whether our 6th and 7th men could out-kick him at the end. With one final surge, both Jordan Lagomarcino and Josh Antonson moved past Zankowski and allowed us to finish with a perfect score. We knew at this point we had a special team. We ran the 2008conference meet at Sunrise Park in Bartlett. It was a sunny day with temperatures in the high 40’s. We managed to win all three levels again and had the individual champion in each race. We ran without Aaron Beattie, our number 2 guy, due to IT problems. We managed to finish 1, 3, 4 in the varsity race. Danny Pawola was the individual champion, winning by 20 seconds. St. Charles North was ranked 6th in the State at the time and had some very good runners. Because we won the conference title for the third time in a row, we got to keep the trophy. The 2007 meet may go down in history as being the greatest team race ever run by us. We went 1, 2, 3, 8, 12, and 13 without our number 2 runner, Jimmy Riddle. This was done vs. two teams who would later finish 4th and 6th at the State meet. Chris Derrick smashed the course record running 13:57. The meet was held at Lake Park and their course typically runs about 5 seconds slower than Detweiller. It was a perfect day to run with temperatures in the low 50’s and no wind. We took the a.m. off the day before for the first time this season and that little bit of rest worked wonders. Our JV and F/S squads also finished 1, 2, 3, in each of their races and we easily won all three team titles. It was this race that we began to realize we had a chance to win the 2007 State championship without Jimmy. Before the 2006 meet began, I told the top seven that every place would count, and it did! Chris Derrick and Jimmy Riddle placed 1st and 2nd with no challenge from anyone. 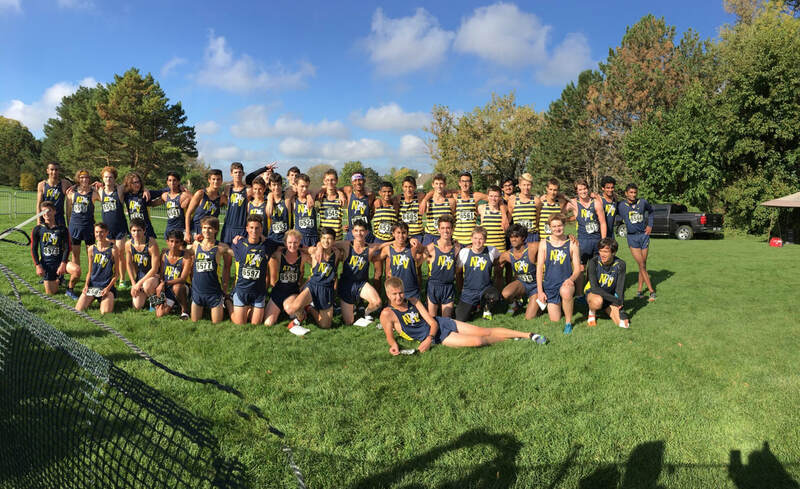 Danny Pawola, Mike Ruff, and Brian Morenus all stepped in front of a competitor at the finish line to enable us to win our 3rd conference title in a nail-biter. We tied with WV, but our 6th man, Brian Morenus, was less than a second ahead of WV’s 6th man. The meet was hosted by Elgin High School at Lordes Park. To add to the drama, the officials had to confer with one another at the awards ceremony before announcing us as conference champions. The top 3 teams went on to finish 2nd, 5th, and 9th at the IHSA State Meet. Our first conference championship occurred during the 2000 season. The meet was held at LeRoy Oakes Forest Preserve in St. Charles. We had five guys place in the top 15 to earn all-conference honors and had all seven men place in the top 20. The day was sunny and boasted 70 degree temperatures. This meet was the highlight of the season, for we just missed qualifying for State by finishing a close 6th at the Sectional meet. St. Charles East was the dominant program in the conference and for the ‘new guys on the block’ to win this meet was a huge breakthrough for us.